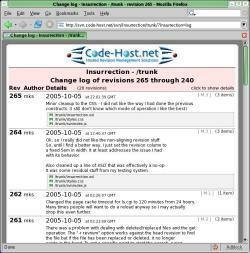 One of my pet projects has been to build a better web based interface to a revision control system known as Subversion. The Insurrection project is the result of that effort. 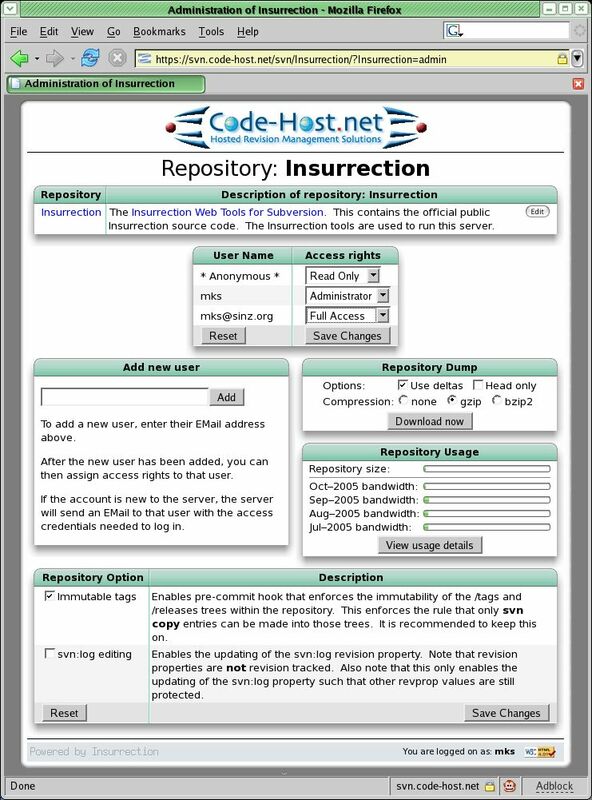 While it is still under development, it already is a very compelling web interface to Subversion and is in active use in a number of places. Must work without the need to install anything on the host OS. This means that all of the functionality of this system must work in a user process with a locally built Apache and Subversion code base. We do assume some basic features of a "unix" like operating environment, such as having a basic Perl installation. 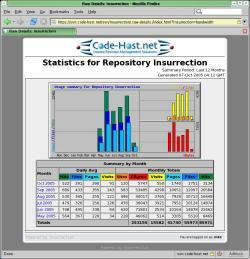 To provide a way to administrate and support multiple repositories on the same server. Currently the code does not support a single repository only format since it assumes a multi-repository structure. Support for single repository configuration will be looked at if it does not adversely impact the support for multiple repositories. To make sure that we don't use any more bad puns as we have used our allowance in the naming of this project. 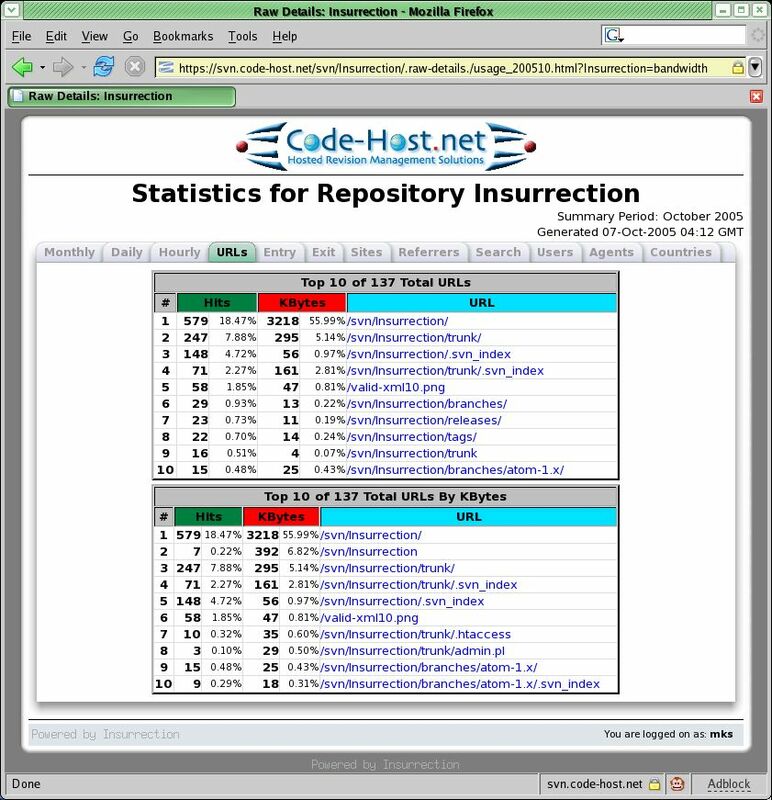 The current code is in active use on a number non-public Subversion servers. This does not mean that the project is complete but it is relatively stable. Many things have not been cleaned up or as fully supported as I would like. There is also a lack of clean documentation as to how to install the code. This is because, so far, it has always been installed by the same person who wrote it. 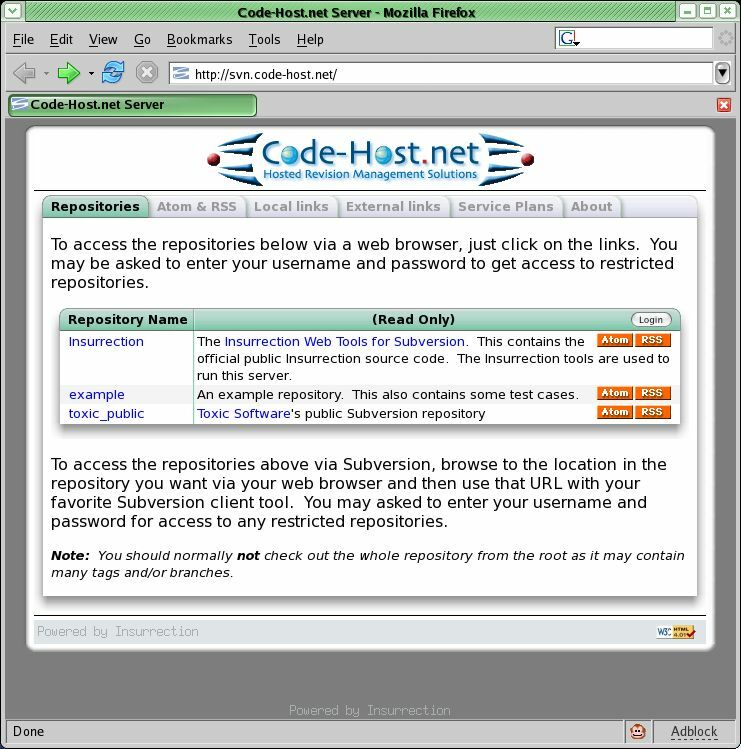 The main page is template driven, with the repositories the logged in user has access to being displayed. 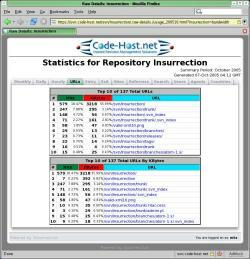 Annonymous users will only see repositories that have annonymous access enabled. As you can see, each repository gets its own RSS and Atom feed links in addition to a customizable description. Login can be handled via HTTP/SSL or just normal HTTP. 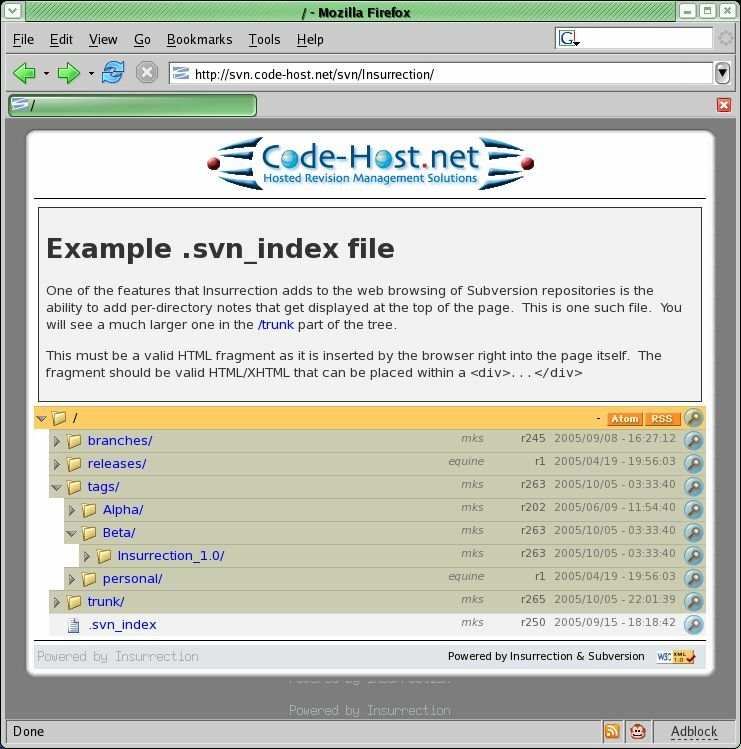 The access user name and password is exactly those of Subversion's WebDAV system such that there is no confusion or possibility of them getting out of sync. RSS and Atom feeds are not restricted to whole repositories. Subtrees and individual files can also be selected for RSS/Atom feeds. 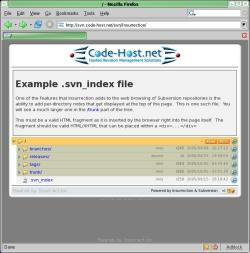 The directory feeds can easily be selected during the browsing of the repository. The icon is the button to select the revision history entries of the repository that pertain to that given item. 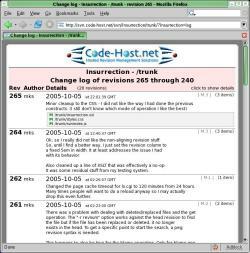 If the item is a directory, the history will include any changes made within that directory tree. 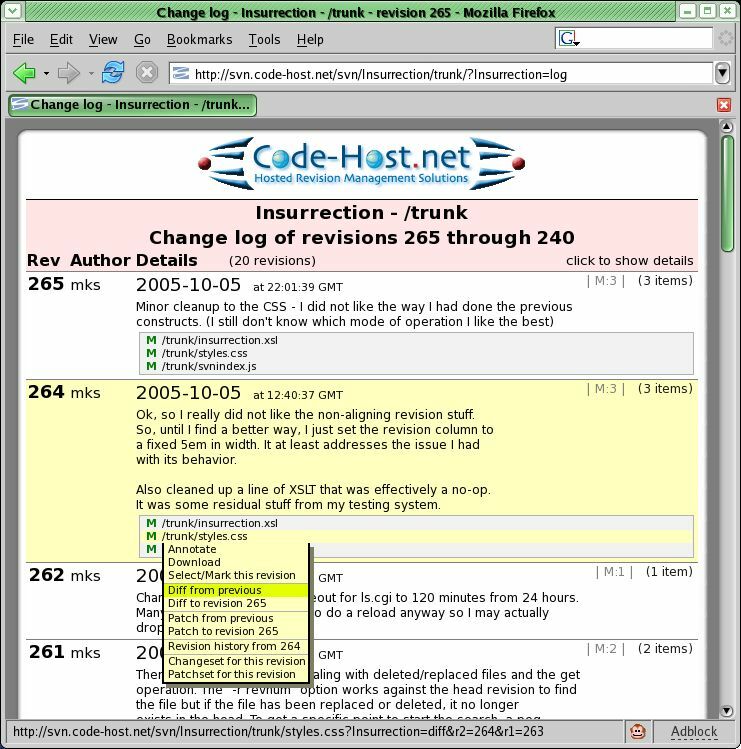 If the item is a file, the history will include any revision which updated that file. 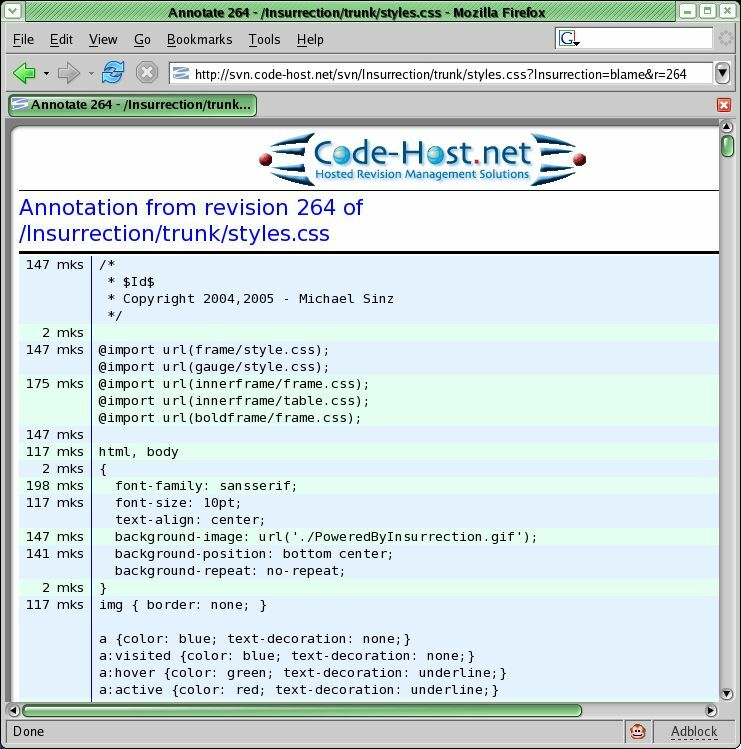 Here we got the revision history of "/trunk" from within the Insurrection repository that was being browsed in the screen shots above. 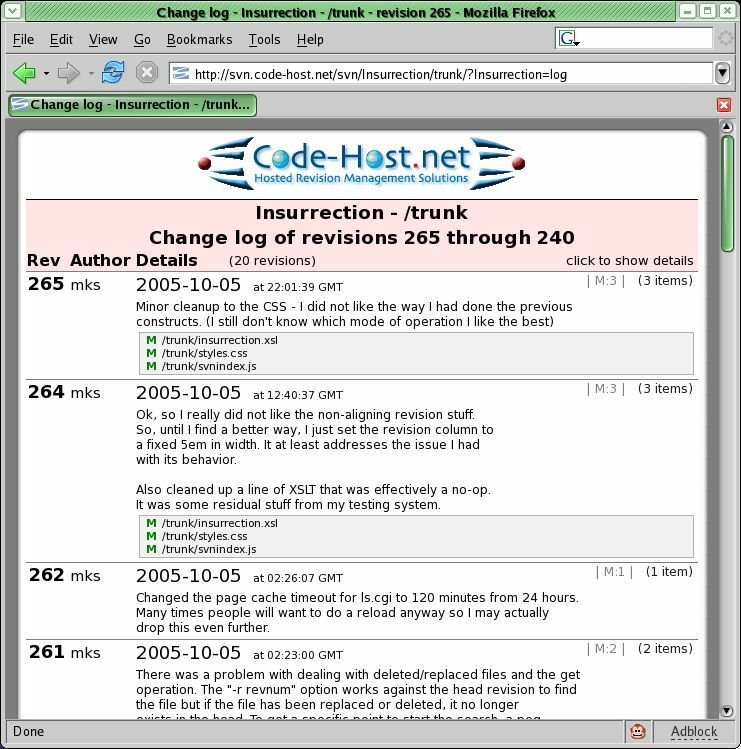 The log shows the commit message for each revision and, when clicked on, the details as to what files where added, deleted, modified, etc. The second picture shows what happens after having clicked on revision 264. For each file listed in the revision details, a popup menu is available that lets you select various operations on that file. In this screen shot we are selecting the "Diff from previous" option which shows us the differences from the previous version of the file. The "Patch from previous" would produce a patch file that would be usable to patch the previous version into the new version. 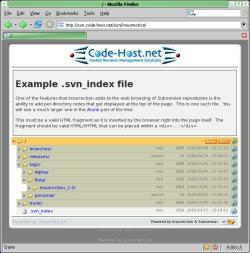 The second screen shot shows the HTML diff output. One can also select a specific revision that can then be used to diff against elsewhere in the page. Note that this selection is currently on a specific filename. I am going to be working on removing that requirement. 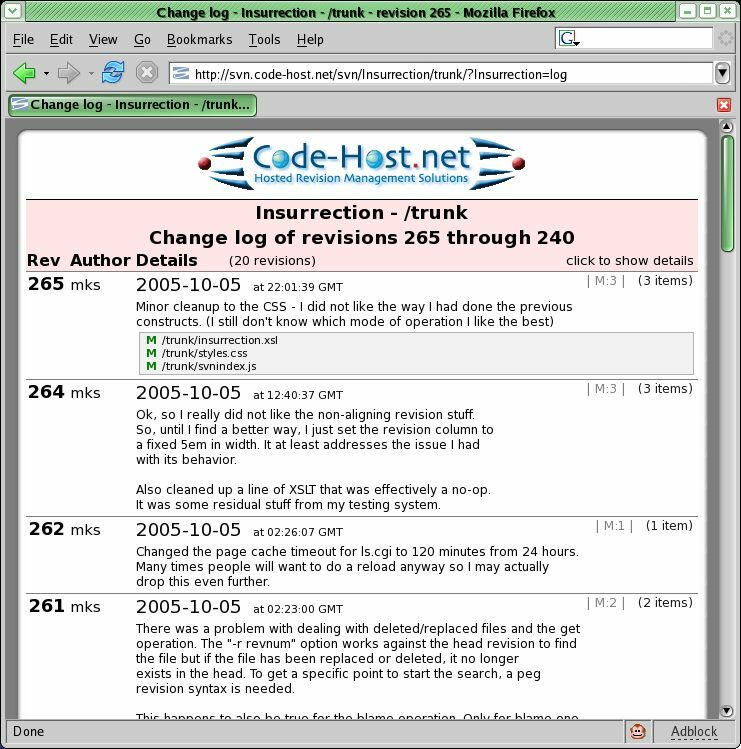 The second screen shot here shows the result of the "annotate" or "blame" feature. 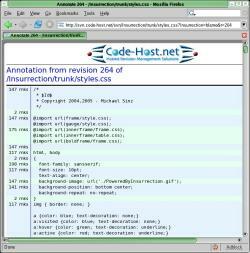 It shows the author and revision that the given lines were last modified/added. Thus, if you want to know who last touched a bit of code you can easily do so. Clicking on a revision in the annotate display will get you the revision entry for that revision of the file. 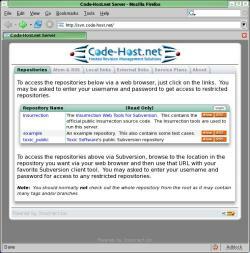 This is the administrative page for a repository. Users who are defined as admins for a given repository will be able to access this page. 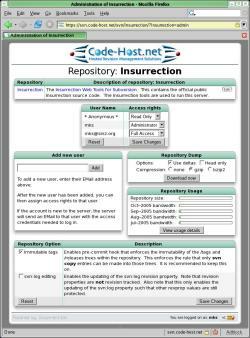 From here the administrator can change the repository description, change user access rights, add new users, download a dump/backup of the repository, and configure certain hook features. I have put together some simple tests of the client-side/browser capabilities that the Insurrection system needs. 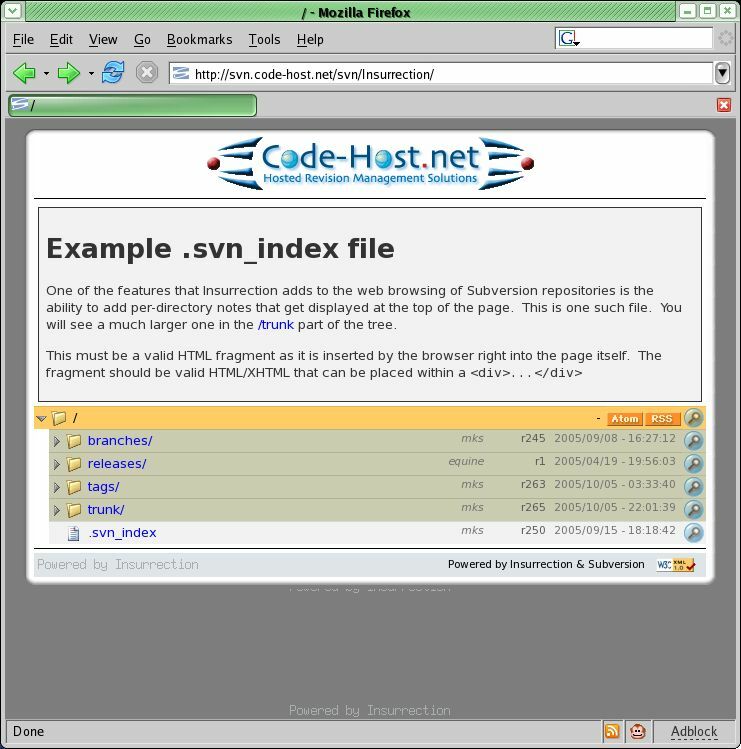 You can try these tests at http://svn.code-host.net/browser-tests/ and the source for these tests are in the source repository. 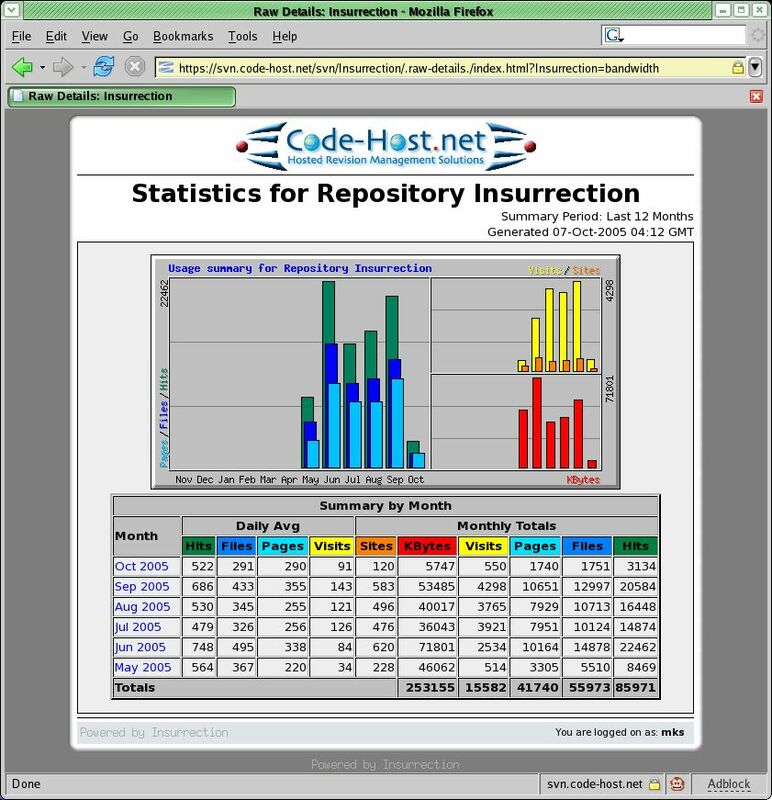 The goal of this set of tools is to become a reasonably complete Subversion repository browsing system plus a simple administration system for repository access controls.